One of my favorite parts of the New Testament is the Sermon on the Mount. And one of my favorite portions of the Sermon on the Mount is the Beatitudes. Something so simple, yet that we can learn so much from. I wanted a visual and visible reminder of this so I created a free printable Beatitudes wall art to hang beside my desk. 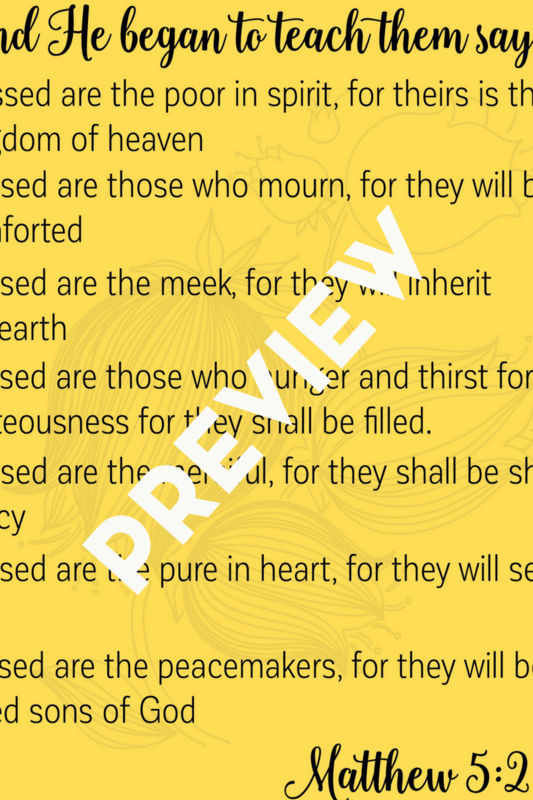 If you are looking to work on this with your children, then I would suggest taking a look at my Beatitudes for Kids printable pack. I’m planning on making more Beatitudes themed printables -both for adults and for children. This includes a journal, verse/memory cards, coloring pages, and more wall art. In the meantime though, I wanted to create this simple piece of printable Beatitudes wall art to share. Why? Because I love the Beatitudes. One of my words for this year, on a personal level, is mercy. Another word that I am working on is grace. But let’s get back to the word, “mercy” and how it relates to the Beatitudes. But what exactly is mercy? So is mercy the same as grace? Mercy is God not punishing us as our sins deserve, and grace is God blessing us despite the fact that we do not deserve it. Mercy is deliverance from judgment. Grace is extending kindness to the unworthy. So we can show kindness by having grace. And we can show mercy by having grace. Your free copy of this wall art will be full size (8×10) and not have the “preview” on it. Download it now, in this post, for the rest of this month (until 3/31/2017) – after which it will be moved to my free content club. Are you familiar with the Beatitudes? Do you have a favorite? Want a version to color? I’m creating a set of free printable Beatitude coloring pages. This is perfect! I’m beginning a study on the Beatitudes in a couple of weeks with 8 or so ladies from a local church. It’s only six weeks long and we do the study together each week. I’m hoping to supplement with some additional information. I also wanted to give them a coloring page. I googled…and there you were!! Please let me know if the date at the top of your page refers to 2017 – I’m actually wondering if you have additional pages by now. Thanks!! So excited!